One of my first posts on this blog was about where the trousers meet the chain — a peculiar but persistent sticking point in the story of North American transportational cycling. Any American who has cycled in everyday clothes has had to confront this issue at least once. You’ve rolled up your right pant leg, or stuffed it into your sock, or decided that you’ll only wear knickerbockers — all because otherwise your pant leg would get grease-stained or shredded by the chain and chainrings of your bike. This is a good example of what’s wrong with the bikes we’re accustomed to. Instead of designing the bicycle to solve the problem, we solve the problem by changing the way we dress, in a minuscule but significant way (and if you’ve ever walked around a conference for two hours, shaking hands and passing out business cards, only to realize that you forgot to roll down your right pant leg, you’ll know what I mean by “significant”). The American way: Going by bike? Wear special pants, or at least a Trouser Accessory. 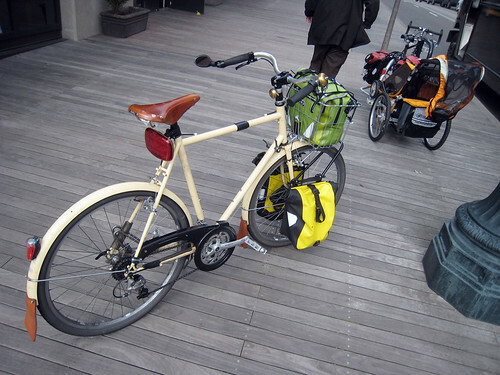 In contrast, on a city bike, the bike protects your clothing by using a chainguard or chaincase to keep your pants or skirt (and shoelaces) out of the chain and chainring teeth. With a chainguard on your bike, you can go ahead and wear whatever you want. Et voilà, Vélocouture! But the majority of bikes used by Americans don’t come equipped with functional chainguards or chaincases, and until recently there were no effective, well-designed chainguards available for the various bikes that North Americans use. Enter the SKS Chainboard, an aftermarket chainguard designed to be fitted to a wide range of bikes. The Chainboard is a new item on the market. I knew I needed to give it a test as soon as I found out about it. My first thought was that if this thing actually works, it wil change the way that Americans dress on their bikes. Here is a chainguard that offers nearly full coverage of the chain and completely encircles the chainring. Most significantly, it is designed to fit a variety of bikes and to accommodate both front and rear derailleurs. This last bit verges on revolutionary. Nearly all bicycles used by North Americans have derailleurs front and rear, and until now there has been no chainguard designed for use with front derailleurs. I tested a 199mm Chainboard on my Kogswell P/R, a fat-tired city bike with front and rear derailleurs. I use a triple chainring up front, but I almost never use the big 48-tooth ring. If you like to install metal fenders — the ones you have to drill yourself, and install/test/remove repeatedly until you get the fit just right — you will LOVE installing the Chainboard. The rest of us should leave it to our bike mechanic. Believe me, it’s worth the labor costs. I did manage to install the Chainboard myself, but did not get it to run smoothly and silently until I had it adjusted at a shop. 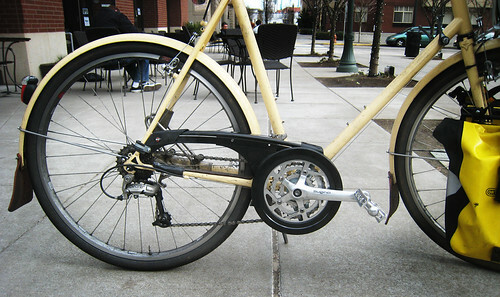 If you do decide to install it yourself, note that the only instruction included on the package is a small diagram indicating how to sandwich the chainguard mount in between the bottom bracket shell and the bottom bracket cup. SKS says there will soon be more informative installation instructions available online. Theoretically, using the 199mm Chainboard, I should have been able to use my front derailleur and all three of my chainrings. However, neither I nor a local bike mechanic could adjust the guard so that I could shift to the big ring. As I don’t use my big chainring, this is not a deal-breaker for me, but it’s something to keep in mind. Does this chainguard make me look fat? Here is an instructive moment for those who seek the true nature of this blog. Sometimes we talk about making your bike pretty, or the stylishness of one bike part or another. But the Chainboard is all about enhancing the way you look, not how your bike looks. To put it bluntly: It ain’t pretty. It’s big, it’s clunky, it’s black, and it’s plastic. Think of it as orthopedic shoes for your bike style, except instead of you wearing ugly black shoes, your bike wears an ugly black chainguard so that you can dress however you want. Now that I’ve resolved the few glitches mentioned above, the chainguard has worked just fine. After a lifetime of rolling up my pants or paying the price, it feels genuinely odd to just get on my bike, trousers flapping freely, and pedal away. It seems like such a minor thing to fuss about, until you’ve tried it, and then you see that a chainguard is essential to cycling as an everyday, every-person form of transport. Chainguards (and built-in lights, and fenders, and skirt guards) remove cycling from the realm of the “special” — special equipment, special knowledge, special clothing — and into the realm of the normal and the everyday. You just don’t think about it anymore: whether you’re wearing long pants; whether you can find that blasted trouser clip; how cold your ankle is on a winter morning with your pants rolled up; whether you remembered to unroll your right trouser leg before walking into the job interview. Let the great unrolling begin! Click here for product information on the manufacturer’s website. Nice. I’m with you on the idea of an accessory for you vs. one for your bike. Well worth it. Any thoughts on whether this could be McGuyvered to fit an Xtracycle? I still prefer a full chain case, which not only protects your clothes but also, I’m told, reduces maintenance by keeping road crud out of the chain. But there must be reason that so many bikes have for years (including many of those old Schwinns from the 50s and 60s, I think) have used only the half-covering chain guards. Is it to make it easier to lube and clean your chain? But if you have the full guard, maybe you don’t need to clean and lube very often? I think one reason why some of those bikes have just the top chain guard is because of the advent of derailleur gears – with an internally geared hub, a full chain case is easy, but with derailleurs, they don’t really work. Granted, Schwinn made a bunch of bikes with internally geared hubs and just top chain guards (we own one). It might have been a stylistic choice, who knows. Anyway, since in the US we see almost entirely derailleur geared bikes since the 1960’s really, we don’t see a lot of full chain cases. I’ve heard for an exposed chain, you’re supposed to replace the chain about every year, whereas with a full chain case, you can go 3-4 years or more. It feels kind of weird, as I’m an American who really got into riding a bike regularly on a bike with a (mostly) full chaincase, fenders, generator light, etc (though I do have distant memories of getting my pants greasy on my rarely-ridden mountain bike in high school). I would never go any other way now. I love the freedom of just getting on my bike whenever I need to and no extra gear needed, everything there and ready to go when I need it. Hopefully as they make further revisions of this chainguard, they’ll make improvements and see what they need to change to make it work better. The US is a tough market for this kind of thing, as I think something that is well made, with some heft to it, really enhances the aesthetics (not to mention often the functionality), but people are so concerned about the weight of their bike that the sales of an add-on chain guard would probably go way down if it was steel and not plastic. Nice idea, but I have a 53T ring on my crank to compensate for my tiny folding-bike wheels. Does anyone make a chain guard for rings that big? crosius, not that i know of, but in any event, i’d think an aftermarket chainguard on a folding bike would be a complete disaster. the only way a chainguard could handle the stresses of a folding bike would be if it were custom designed for that bike– otherwise it’d always get bent up or scraping on one thing or another. One of the first ‘customizations’ I remember requesting/performing on my bicycle as a child was the removal of the chain guard, as trying to remount a dropped chain was a (even more) greasy nuisance due to the guard. Now I don’t drop chains very often anymore…a few times a year or so it seems, but the other day I stopped and helped an older gentleman wheeling his bike up to the shop 3 hours before they were due to open, and he had dropped his chain. Having to remove a chainguard to do it would have complicated matters quite a bit. Maintenance with a full chain guard? I have to say I’m dubious. But being allowed to allowed to wear shorts and other such casual clothing to work is coloring my opinion. I have one of those half guards on my bike and I am known for my quite spectacular throwing of chains. The guard does make it a little more difficult to get the chain back on, but after a half dozen times, you get it down and it isn’t a problem : D I actually keep a pair of surgical gloves in my little tool kit for just these times. I just wanted to let you know that I am now obsessed with the idea of a chain guard. I got back from England and Italy today and it was a truly porny experience for checking out city bikes. The majority of them sported chain guards. I also saw tons of skirt guards! And the only people wearing bike gear were clearly on touring trips. These things are great, but the installation process is just that, a process. Installing an SKS Chain Board takes patience, bottom bracket tools and a grinder capable of removing enough material so that the front derailleur can move up into the high gear. 0. Put the bike up in your repair stand. 1. Mount the L bracket behind the right bottom bracket shell, without putting the crank back on. You may need to face the bottom bracket shell to get a flat fit. 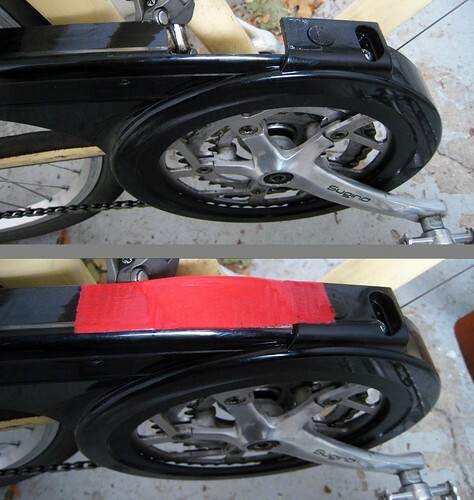 The back end of the chain guard may be trimmed to fit in the rear triangle, but the angle of installation is not flat. It should tilt downward slightly, back to front. Watch out for derailleur cables and whatnot. 3. Take the guard off by the screws and start removing material in the outlined area. There is plenty of material to do this, and it should not compromise the structural integrity of the chain guard. Do not worry about the crank rubbing on the chain board just yet, if it makes noise you’re fine, if it actually sticks and holds up, keep removing material from your front derailleur outlined area. Continue little by little and keep test mating it. Once the you can shift to the big ring, do not have excessive friction rubbing between the front derailleur, the guard, and the crank, you may move on. 4. Now we take on the task of twisting the chain guard while a friend is pedaling the bike to eliminate the noise of the chain hitting the chain guard. There are three mounting points that may be manipulated and twisted to keep the chain from hitting the guard. Try reversing the screws so that the flatter screw heads are on the inside allowing for a tighter threshold in the rear end of the bike. 5. Once the noise is eliminated down to only the noise produced by the crank arm rubbing on the outside of the guard, you’re basically done. This noise doesn’t occur on the road or when under foot, and the RPM in this gear is generally pretty low, which makes noise problems minimal. — The most important place to eliminate friction is when the front derailleur is sandwiched between the chain and the chain board in the big ring. — Ordering the right size is crucial, count the teeth. — Sometimes it just doesn’t work, the gap between the crank arm and the front derailleur is simply too narrow. — If you want to settle with not having a big gear, that’s fine, but I like to use all the letters in the alphabet, call me a zealot. Any other ideas? Clarifications? It took 2 hours on my first attempt. It took me about 45 minutes on my second attempt in my undisclosed bike shop. So that’s about 45 dollars at any other reputable shop, and is certainly worth it if you can find a tech willing to install one of these things. SKS Germany voted #1 (pump) product company. Read the fine print. Even so, a good burly product. casey, thanks for putting this together– it practically deserves to be its own post. regarding your mention of my red duct tape, the chainguard that I got had a slot already created in it. I gather that now (or on the silver ones) that slot is user-created. I just installed one of these, and in the (3 hour) process, intuited (and carried out) many of Casey’s modifications. The crazy thing about this product is that I haven’t yet seen, in a review or in comments, a single instance of an installation working smoothly. And yet, given that many of us seem to be able to alter it (grinding, bending, cutting, taping) in home shops so that it fits between crank arm and derailleur, it could have been designed to fit the majority of bikes in the first place. Great idea. Lousy design. I hope SKS (or someone) has a better design on the drawing board. There are tens of thousands of mountain bikes in the US sitting in garages, waiting to become something more than occasional recreational toys, and a workable chainguard is a critical part of that transformation. I just installed my SKS Chainguard and it wasn’t very difficult with the right tools. My front derailleur was hitting just a little bit so I lowered the clamp and it still works fine after a small cable adjustment. No more rolling up my pant leg!